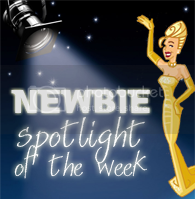 Welcome to the second Newbie spotlight feature of the week. Our first features I would say went very well. Of course, I have an awesome tag team, so I knew that would help. Kathryn did an absolutely beautiful job, and gives you the step by step on how she transformed and stenciled these pots. of Thrifting, painting furniture and all things decorating related. My kind of gal, my kind of hubby! Congrats Kathryn on your feature. Hope you will take a minute to visit her and welcome her to the blogging community. Thanks to everyone who joined in the Newbie party this week. It was really hopping. You may be next….see you next week! This is so much fun! I will be surprised to see who they picked! What a great pick! Those pots are so pretty! I’ll pop on over to see Kathryn now. I just visited her blog. It’s just great. Great spotlight Debbie these are awesome!! Popping over there to say hi! Off to check her blog, these are super cute! Cute pots! Perfect Summertime project =) Always nice when the hubby “gets it” too. Lucky lady!! I love this pretty project! Something fun for Spring! Thanks soooooo much for the spotlight!!! I’m thrilled to be chosen! Right now my hubby is putting up with a garage and house filled with half finished projects for a Vintage Market I’m going to be a vendor at at the end of June (hee hee). Too cute. It’s amazing how a little paint can completely transform something. Kathryn is crafty! Love the spotlight choice. Oh those are so pretty – off to check out her blog! Beautiful pots but even more I wanted to drop you a note to tell you again how appreciated you are for showcasing and mentoring new bloggers. You are just simply, terrific. Great pots! Awesome job! can’t wait to visit her blog. Oh — these are so pretty! I love the look of these — off to check her out! I just popped over to welcome Kathryn. She should do very well here in blogland. Any newbie of Debbie’s is a newbie of mine, so going over to say hello. These little stenciled pots are so adorable. I’ll have to go check out her blog. What fun! My daughter and I are now sharing a love of junque-tiking and upcycling our way thru second hand stores and yard sales. These pots are gorgeous!!! I’ve not been the best with stencil, so these pots make me want to try harder. They are beauties!